Gift of Mr. and Mrs. Ladislaus Von Hoffmann, November 8, 2012. The colophon on fol. 220v of the parent codex, the so-called Belluno Gradual, stated that the gradual was commissioned by Franciscus de Bolzano, friar of the minorite [Franciscan] order, for the Franciscan convent of San Pietro at Belluno from Ludovico de Gaçis, a citizen of Cremona. who as scribe and illuuminator, finished the gradual on 10 April 1498; the princes of Stolberg-Wernigerode, at Schloss Wernigerode (their codex 40), until the late nineteenth century; Kurt Arnhold of Dresden (1887-1951) (his MS 36); New York, sold to Kraus and Schab; New York, H.P. Kraus, Catalogue 88 , no 46; bought by Mark Lansburgh, originally Santa Barbara, later Colorado Springs, in 1959 (de Ricci Supplement, 1962, 25, no. 5); his Ms 5 and sale, Sotheby’s 10 June 1963 to Traylen; codex dismembered by 1969 when individual leaves appeared for sale; New York, Inmans Book Shop, Catalogue no. 110 (Illuminated Manuscript Leaves on Vellum from an Italian 15th Century Gradual Written and Illuminated by Ludovicum de Gacis at Cremona, 1489) ; Ladislaus Von Hoffmann, Washington, D.C.; his sale London, Christie’s, 7 July 2010 (The Arcana Collection: Exceptional Illuminated Manuscripts and Incunabula, Part I) lot 26 unsold; given by Von Hoffmann to the Morgan. Written and illuminated in Cremona, Italy by Ludovico de Gacis who completed the manuscript on April 10, 1489. According to the colophon the Gradual was commissioned by Reverend Franciscus de Bolzano for the Franciscan convent of San Pietro at Belluno [about 65 miles north of Venice], Italy. Decoration: single leaf with historiated initial (St. Andrew) and full border. 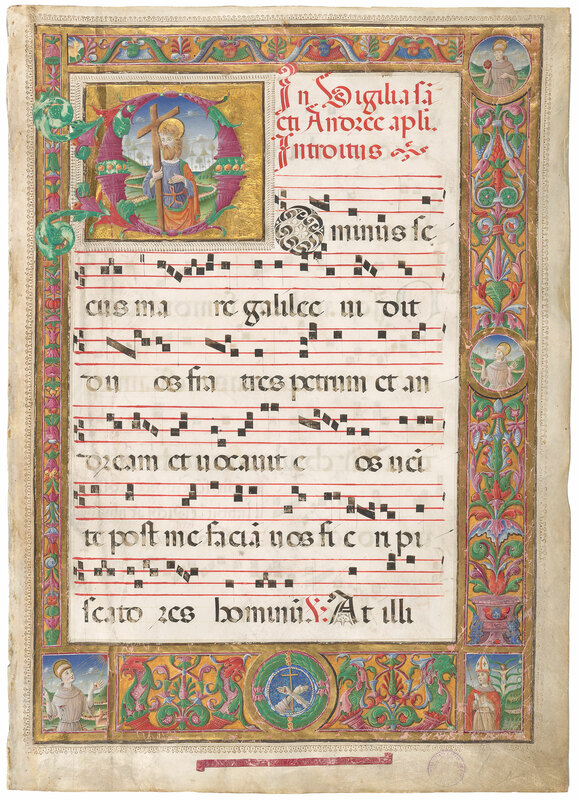 Frontispiece of the Belluno Gradual with an historiated initial "D" opening the Introit Dominus secus mare Galilee for the vigil of the Feast of St. Andrew (29 Nov.), depicting St. Andrew, the first saint celebrated in the Sanctorale. The rubric, in red, reads: "In Digilia sa[n]cti Andree ap[osto]li Introitus." St. Andrew holds a cross in a landscape before a rocky road, the initial is composed of a cornucopia and acanthus terminals against a burnished gold ground. Four half-length Franciscan saints in the full border of Renaissance ornament include: Bernard, Anthony, Bonaventure with the Arbor Crucis and Francis of Assisi receiving the stigmata. At the center of the lower border is a wreath enclosing the emblem of the Franciscan order [two arms crossed, one bleeding from the hand, before a cross]. Below the border is a red banderole inscribed in liquid gold capitals, OPUS: CONVENTUS MINORUM CIVIDALIS BELLONE: LUDOVICUS P[INXIT]. There are 7 lines with musical notation in black on a red four-line stave. The purple ownership stamp of the library of the princes of Stolberg-Wernigerode appears at the bottom right. Musical notation appears on the reverse. The colophon of the parent codex, which was broken up by 1969, states on fol. 220v: "Hoc opus scriptum notatum ac minatum fuit penna et pennello Cremone, per me Ludovicum de gaçis civem Cremonensem. Cuius operis institutor fuit R[evere] Indus p[late]r Sacre Theologie professor Magist[er] Franciscus de Bolzano ordinis minor[um] pro usu conventus cividalis Bellone. 1.4.8.9. Die X Aprilis." Ludovico de Gacis also signed his name on folio 46v. The gradual originally included thirteen folios with historiated initials. Besides the leaf with the initial with St. Andrew the Morgan has a second leaf from this manuscript with an historiated initial of St. Francis, Morgan MS m. 1177. An initial D with Sts. Peter and Paul, fol. 33, is today in Washington, National Gallery of Art, Lessing J. Rosenwald Collection (Carra Ferguson et al., Medieval & Renaissance Miniatures from the National Gallery of Art, Washngton, 1975, 84-87, no. 24). The initial I with St. Anthony of Padua and a Franciscan friar, fol. 27, sold at Christie’s, London, June 1994, lot 21. Franciscus de Bolzano, a friar of the convent of San Pietro at Belluno, was a scholar of Greek and Latin and San Pietro’s master of theology. San Pietro was suppressed by Napoleonic decree and abandoned on 16 July 1807.